We will decorate to match your color theme. Sunday and weeknight hall space at a rate of $300 for a three hour event or $450 for Saturdays. Includes 1/2 hour to set up and 1/2 hour to clean up for a total of 4 hours. $100 per additional hour. ($25 per hour for extra decorating time only) Contact venue for quote if bringing in alcohol. Great for Baby showers, wedding showers, meetings, networking, small events. 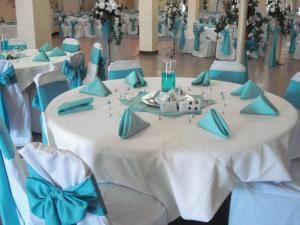 Tablecloths, napkins, centerpieces and security are not included but available for $10 per table. You can also bring in your own linens and decorations. Planning a small wedding of 50 to 70 guests? You can have a beautiful wedding on a budget. We have put together an affordable package for a small weddings Package pricing: - Sunday and Weeknights: $1,400, $1,700 with bartender - Saturdays: $1,900, $2,200 with bartender The Intimate Wedding Package includes: - Hall rental and set up of tables, chairs, linens and decorations - Hall decorations (to match your color theme) - Linen tablecloths (White or Ivory) - Linen napkins in your choice of color(s) - White chair covers with bows on reception chairs - Votive candles on guest tables (you provide the tealites) - Centerpieces for the guest tables (many to choose from, and we will match your theme) - Head table centerpiece (several to choose from) - Security and attendant on the premises throughout your event Bring in your own food and drink. This is a self service facility. Services are provided at additonal costs per service provider. Example: Servers, Dishwashers, Clean up etc. Packages with bartender does not include liquor. *Plan an early wedding that concludes by 9:00 p.m. and get $100.00 off the package price The additional costs cover the certified and insured bartenders and additional security guards for a 5 hour period. Both are required to be on the premises any time alcohol is being served. We do not provide liquor of any type. If you are going to provide liquor for your guests please pick a package that includes the bartender. All packages are based on a 5 hour event. Monday-Fri. available 6:00 p.m.11:30 p.m. Saturday 2:00 p.m.-11:30 p.m. Sunday 10:00 a.m.-9:00 p.m. ADDITIONAL HOURS AVAILABLE AT RATES LISTED BELOW: $100 per additional hour for hall rental and personnel $100 per additional hour for DJ beyond the 5 hour event $30.00 per additional hour for bartender beyond the 5 hour event $30.00 per additional hour for security guard beyond the 5 hour event * ALL EVENTS COMMENCE NO LATER THAN 11:30 P.M. UNLESS APPROVED PRIOR TO EVENT Packages with bar pricing include certified and insured bartender(s) and additional security personel for the 5 hour time period. Packages do not include liquor or soft drinks. Guests must supply liquor, soft drinks, mixers, cups and ice. There is no charge to use our 3 ice chests and freezer. For your convenience we can provide ice, soft drinks and water for your guests at an additional cost. Bartenders 5 hours of service includes the 1/2 hour set up and 1/2 hour take down leaving 4 hours serving time. Large banquet hall or meeting room that can seat up to 200 people and the Onyx room is great for 75 or less people. Atmosphere/Decor: Soft inviting neutral colors. Great for any color theme.